The Adafruit Parts Pal is the ultimate companion for an entry-level maker learning electronics. 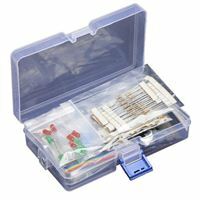 This kit is your friend whenever you need to build up a project. It contains many of our most popular components and prototyping parts all wrapped up in one parts pack so you can open up and dig right in.